You Named This Red Panda! 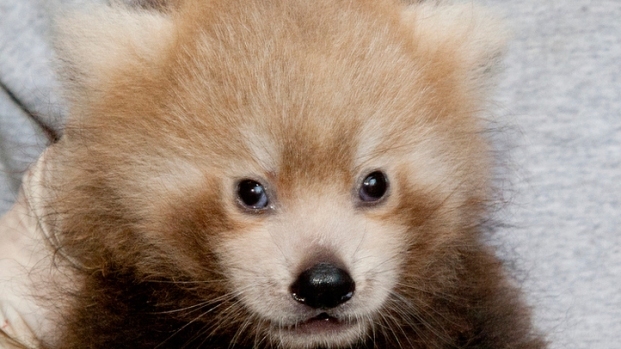 The Smithsonian National Zoo's red pandas are putting those giant pandas to shame. While we all waited with baited breath to see whether Mei-Xiang would grace us with a Butterstick II, in June those industrious red pandas were busy welcoming twins -- and then more twins. Now nearly three months old, the twins from the second batch (born June 17 at the National Zoo after the first set of twins was born at the Front Royal, Va., facility) are receiving identities of their very own. No more dressing alike and sharing a room for these girls! One of the babies has already been named Damini (Nepalese for "lightning") by a zoo supporter. But in conjunction with the National Zoo, you can vote for the other cub's name right here. The zoo explains: "We're going with the storm motif because the cubs were born on a stormy night." Voters chose the name Pili for one of the National Zoo's newest members. It's Chinese for "clap of thunder." UPDATE:The voting is over, and the winning name is... Pili! Pili, which means “clap of thunder” in Chinese, was the winner among four names -- all storm-related -- with 30 percent of the vote. Thanks for taking part in the voting, and make sure you stop by the National Zoo to check out the red pandas!